Bunge faces reputational and market risks. The global agribusiness and food company Bunge is among the largest players in Brazil’s soy supply chain. It is the leading soy trader in Piauí, a state in the Brazil’s Cerrado biome. In Piauí, expansion of soy farms is associated with deforestation and other environmental and social impacts. Downstream companies have called to halt deforestation in the Cerrado biome. The Cerrado Manifesto, published by civil society groups and supported by 23 large consumer goods companies, urges supply chain actors to strengthen the implementation of their zero-deforestation commitments. Bunge continues to source from producers involved in legal deforestation, despite its commitment to achieve zero-deforestation supply chains between 2020-2025 and taking action to stimulate soy expansion into non-forested areas. Failure to meet its commitment could create reputational and market risks. Bunge is the leading soy trader in Piauí. It has the largest storage and processing capacity in the state. Bunge’s market share is between 45 percent (Bunge’s own estimation) and 80 percent (market expert estimation). In 2017, it invested BRL 300 million (USD 90 million) to substantially increase its processing capacity in Piauí. Piauí continues to see high rates of Cerrado deforestation. Between 2010 and 2017, 123,917 hectares (ha) of forest were cleared for soy cultivation expansion. In 2017 alone, 15,000 ha were deforested in Piauí. Bunge has a public zero-deforestation commitment, and excludes suppliers that deforest illegally. However, it continues to source from legally deforested farms. SLC Agrícola and BrasilAgro, two of Bunge’s major soy suppliers, have legally deforested 19,683 ha of native vegetation in Piauí from 2011 to 2017. Both are confirmed Bunge suppliers. Bunge’s most important providers of loans and credit facilities have deforestation policies in place. Bunge can mitigate reputational risks if it stops sourcing deforestation- linked soybeans from Piauí. This would impact asset value equal to one percent of current market capitalization. Should Bunge continue to source soybeans from Piauí undeterred, it risks a value loss equal to 22 percent of its market capitalization. This risk comes from Bunge’s estimated revenues from the 23 companies that support the Cerrado Manifesto. Founded in 1818, Bunge Limited is a global, publicly traded agribusiness and food trading company. Bunge purchases, stores, transports, processes and sells oilseeds and grains to produce animal feed and edible oil products for commercial use. It also operates other business segments including milling products, sugar, and bioenergy and fertilizer. Bunge is the largest agricultural exporter in Brazil. In Brazil, its 2016 reported revenues were BRL 40.5 billion (USD 11.1 billion). The principal commodities handled by Bunge are oilseeds – primarily soybeans – as well as wheat and corn. By the end of 2016, Bunge’s assets in Brazil accounted for 38 percent of its total global assets. With over 100 facilities, including factories, mills, ports, distribution centers, and silos (elevators), the company has a leading position in the soybean supply chain in Brazil. It operates more than 60 silos and eight soybean processing facilities throughout Brazil. The latter comprises one soybean crushing plant in each of the states of Bahia, Goiás, Mato Grosso do Sul, Paraná, Rio Grande, and Piauí, and two in Mato Grosso. 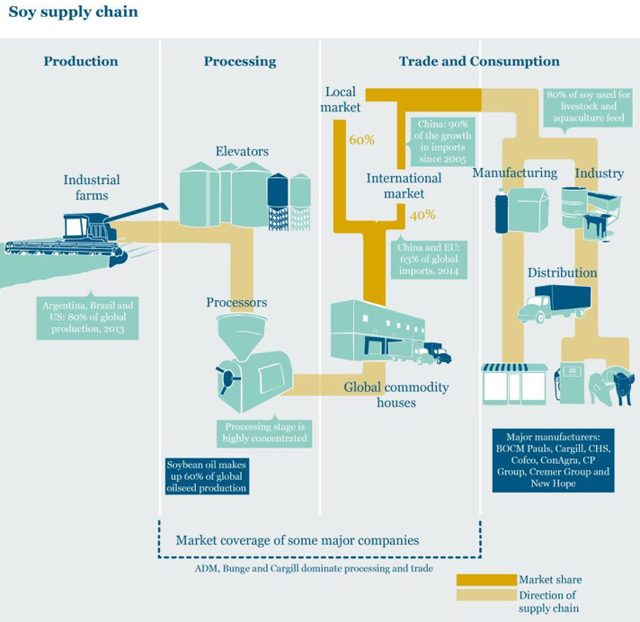 Figure 1 shows a simplified soy supply chain. Figure 1: Soy supply chain. Source: Sustainablesmartbusiness.com. Bunge is the dominant buyer and trader of soybeans in Piauí in terms of market share, storage, processing capacity and infrastructure. Bunge operates the largest silos in Piauí. As shown in Figure 2 (below), these silos are strategically located in the state’s main grain producing areas in the southwest in the municipalities of Uruçuí, Bom Jesus, Baixa Grande do Ribeiro, Currais and Santa Filomena. This maximizes Bunge’s ability to purchase soy from a range of producers. Bunge’s total soybean storage capacity in Piauí is estimated at 694,158 metric tons. Its newest silo in Santa Filomena, an investment of BRL 27 million (USD 90 million), has a storage capacity of 77,000 metric tons. In 2002, Bunge opened the main crushing plant for Piauí in the town of Uruçuí. The crusher, which produces soybean meal and soybean oil, had an (initial) processing capacity of 660,000 metric tons per year. Bunge considers the crushing of soy oilseeds a key growth platform. The company has recently expressed its interest in further expansion in Piauí. It invested BRL 300 million (USD 90 million) to substantially increase its processing capacity in Piauí, to 750,000 metric tons per year in 2017. After crushing into soy meal and oil in the main processing unit in Uruçuí town in Piauí (Figure 2) the soy meal is transported by road to the export port in Itaquí, Maranhão. The oil is largely sold on the domestic market. The state and municipal governments offer a broad incentive policy including tax incentives and exemptions, infrastructure development, and donation of land. Figure 2: Silos and crushing plants of Bunge in Piauí. Source: Sistema de Cadastro Nacional de Unidade Armazenadoras (SICARM). Soy products eventually end up passing through one of the key traders in the Brazilian soy supply chain (ADM, Bunge, Cargill, Cofco, LDC), be it at the storage, processing, transportation or shipping phase. According to market experts, Bunge controls around 70 to 80 percent of the soybeans (grain) market in Piauí, although Bunge itself claims to hold merely 45 percent market share. This figure could not be verified. Competitors Cargill and ADM have strategic positions in adjacent Bahia and Maranhão. Large soy producers in the region operate their own silos and freight systems, but do not have ample storage capacity. SLC Agrícola, one of the largest producers in the region, confirmed that they remain dependent on Bunge as an off-taker of soybeans (Fieldwork by Rede Social de Justiça e Direitos Humanos -REDE- in Brazil in October 2017). A vertically integrated supply chain would be too expensive for such actors. As a result, Bunge functions as a bottleneck for the soy produced in the region. Large producers in Piauí include SLC Agrícola, BrasilAgro, Insolo Agroindustrial, Risa Agricultura, Fazendo Progresso, Celeiro Sementes and Fazenda Canel. The listed companies SLC Agrícola and BrasilAgro publicly report Bunge as a key buyer. Soy plays a key role in Piauí’s economy. In 2017, soybeans accounted for 89 percent of total exports (USD 32.5 million of 36.6 million USD) of Piauí. Bunge currently employs around 500 people in Piauí., which is part of Brazil’s Cerrado. The Cerrado is a large tropical savanna biome that covers more than 20 percent of Brazil. The Cerrado biome hosts five percent of the world’s biodiversity and is considered the most bio-diverse savanna in the world. While Bunge’s operations in the state create jobs, income and revenues, significant expansion of soy farms in Piauí also causes multiple socio-environmental consequences. Piauí is a heavily deforestation-impacted region that also experiences land conflicts and social and environmental impacts from soy production. It is referred to as the last agricultural frontier of the country. In the period from 2010 until 2017, 123,917 ha of forest were cleared on land used for soy production in Piauí (Figure 3). Soy expansion is responsible for 84 percent of the total agricultural expansion in Piauí, whereas 14 percent was caused by corn expansion and two percent by cotton expansion. 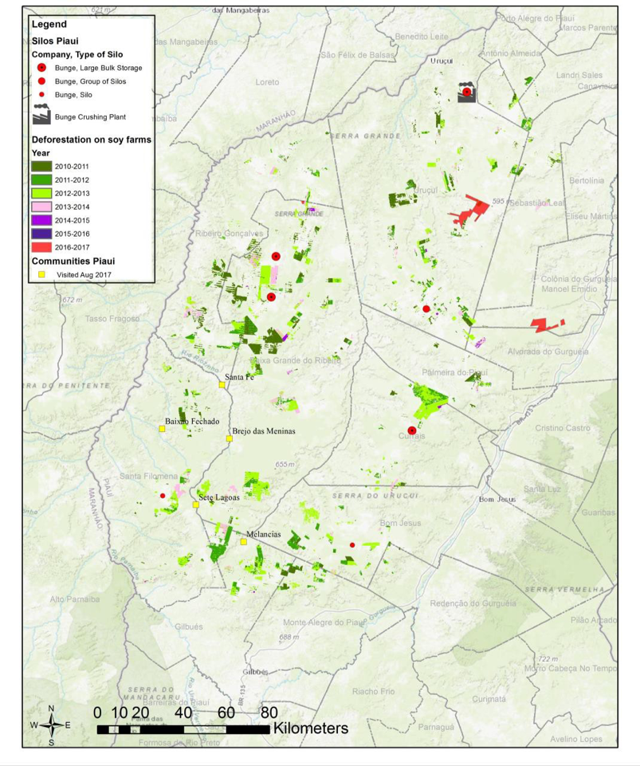 The accelerated deforestation rates in recent years to make space for large-scale production of soybean cultivation in Piauí has been accompanied by land grabbing through violence, intimidation and the intensification of struggles with traditional communities over access to natural resources. In Piauí, at least 124,000 ha of land are currently contested in the state’s court as illegally grabbed. 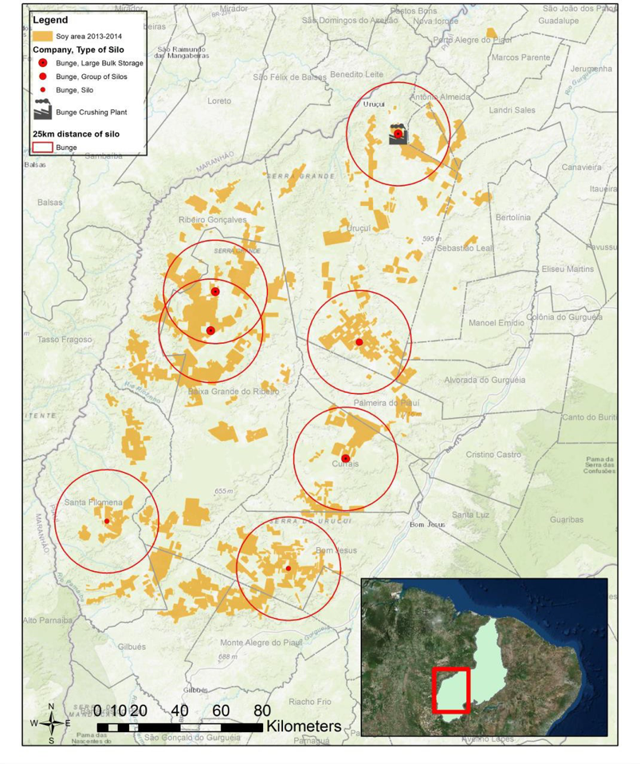 A recent fact-finding mission identified additional social and environmental impacts in southwest Piauí that included agrochemical pollution and health impacts, diminishing biodiversity and natural resources such as water, as well as land grabbing and the intimidation of the traditional communities living in these areas. The visited communities that are affected by soybean cultivation are included in Figure 3. Figure 3: Soy-driven deforestation in southwest Piauí (2010-2017). Source: CRR Landsat and Sentinel-2 satellite analysis, SICARM and Hansen/UMD/Google/USGS/NASA. Large parts of the Cerrado have already been transformed, and Piauí saw high rates of deforestation on soy farms between 2010 and 2013. Deforestation is an ongoing process that continued through 2017, with at least 15,000 ha of land cleared for soy expansion (see example in Figure 4). Figure 4: Example of recent deforestation in municipality of Uruçuí period Nov 2016-Oct 2017. Source: Sentinel-2 satellite images. All of the original native vegetation on soy farms in Piauí is classified as forest (forested savanna and wooded savanna), using the vegetation classification standard of Brazil’s Forest Reference Emissions Level (NYSEARCA:FREL) in the Cerrado Biome (Figure 5). Figure 5: Original vegetation at soy farms in Piauí Source: MMA and IBGE, 2004. Bunge continues to allow soy from legally deforested farms in Piauí to enter its supply chain, despite a strong policy to create zero-deforestation supply chains. Bunge has committed to eliminate deforestation in its supply chain between 2020 and 2025. To reach this goal, Bunge incentivizes sustainable expansion into open land and go zones, and the development of traceable supply chains. Bunge, The Nature Conservancy and a coalition of over 15 other companies, NGOs and government entities have recently launched Agroideal.org. 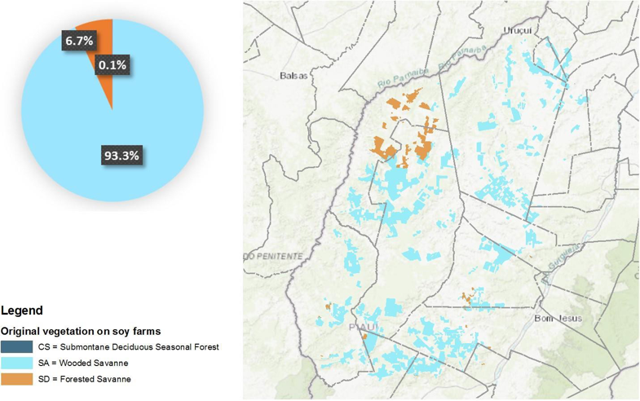 This open source decision support tool “encourages sustainable agricultural expansion in the Cerrado.” It helps purchasers of soy to make decisions on lands suitable for agriculture by integrating environmental, economic and social indicators. Furthermore, Bunge is in the process of developing a financial incentive program that encourages and rewards suppliers who avoid deforestation and intensify agricultural production in existing lands. Bunge makes a distinction between legal and illegal deforestation. The company made public zero-deforestation commitments in 2015, but it asserts that certain levels of deforestation are legal in its operating areas. The Brazilian Forest Code requires private landowners in the Cerrado (including Piauí) to maintain 35 percent of land as legal reserves (in contrast, legal reserves in the Amazon must cover 80 percent). This leaves room for soy producers to legally deforest native Cerrado vegetation, as demonstrated in the previous section. The wording of Bunge’s policy suggests that soy from legally deforested areas continues to be accepted. A powerful incentive to stop producers from deforestation practices is cutting off access to markets by suspending those farmers that engage in deforestation activities. This has proven successful in the Brazilian Amazon. In the context of the Cerrado, Bunge’s existing sanction mechanism does not apply to suppliers responsible for the bulk of the deforestation. Previous research from Chain Reaction Research demonstrates that soy producers SLC Agrícola and BrasilAgro have legally deforested 19,683 ha of Cerrado vegetation in Piauí from 2011 to 2017. Both companies are confirmed suppliers of Bunge. Ongoing deforestation in Bunge’s supply chain, whether legal or illegal, exposes the company to several operational business risks. Bunge is exposed to reputational risks if it fails to achieve the zero-deforestation commitments it has set for 2020-2025. Currently, Bunge positions itself as the frontrunner in the soy deforestation discussion. However, continued sourcing of soy from legally deforested farms poses the risk that it will not meet its public commitments. Closing the gaps in Bunge’s deforestation policy requires a halt of all forms of deforestation. Moreover, it requires suspension of suppliers engaged in deforestation of native vegetation in Piauí. Under the heading of legal deforestation, 123,917 ha of Southwest Piauí forests have been deforested between 2010-2017. Denial of market access provides a powerful incentive to stop producers from deforestation practices. Many of the large soy consuming companies are members of the Consumer Goods Forum and have committed themselves to zero net deforestation in their supply chains by 2020. Large consumers of soy are increasingly addressing the issue of Cerrado deforestation. Unless Bunge addresses the sustainability impacts in its supply chain originating in the agricultural frontier of Brazil’s Cerrado (including Piauí), Bunge’s commercial relationships with these members and other companies might be affected. significant impacts. A combination of incentives for deforestation-free expansion with a sanctioning mechanism for non-compliance could deter agribusiness from unsustainable soy production. Such an approach would mitigate both the reputational and market risks described above. What are the risks for Bunge related to deforestation-linked soy from Piauí to enter its supply chain? What are the most likely scenarios related to Bunge’s reaction to deforestation risks? What are the operational and financial consequences of these scenarios, including costs of potentially stranded assets in Piauí? If Bunge continues to allow deforestation-linked soy in its supply chain, what are the costs? Who is financing Bunge’s debt and equity and how will non-compliance related to deforestation in Piauí impact these relations? In total, what are the risks for the holders of debt and equity, related to non- compliance on deforestation, or by the impact of ‘stranded assets’? In the last five years (2012-2016), the net revenues of Bunge steadily decreased from USD 61 billion (2012) to USD 42.7 billion (2016). For the financial year ending December 2017, the net revenues are expected to slightly increase to USD 46.8 billion (Bloomberg consensus estimates). With declining net revenues, Earnings Before Interest, Taxes, Depreciation and Amortization (EBITDA) was relatively volatile for 2012-2016, within the range of USD 1.6 billion (2012) and USD 2.5 billion (2013). The 2017E EBITDA (Bloomberg consensus) is USD 1.3 billion. Figure 6: Key figures of Bunge. Source: Bloomberg. Financial years until end of December. The relatively large decrease of net revenues from USD 57.2 billion (2014) to USD 43.5 billion (2015) was primarily driven by significantly lower global commodity prices in 2015. Soybean prices were on average 24 percent lower in 2015. This shows that Bunge’s operating results are to a large extent dependent on agricultural commodity prices. 2017’s gross profit was in particular weak in the first half due to slow farmer selling, but is recovering in the second half. Bunge operates in five different segments. In the financial year ending December 2016, 70 percent of net revenues was generated from its ‘agribusiness’ segment. This segment is principally involved in the purchase, storage, transport, processing and sale of agricultural commodities (grain, soybeans, rapeseed, canola and sunflower seeds) and other commodity products. The remaining 30 percent of net revenues was mainly generated through its segments ‘edible oil products’ (16 percent), ‘sugar and bioenergy’ (nine percent), and ‘milling products’ (four percent). Bunge’s EBITDA margin is relatively low because Bunge is a trader with a low asset turnover ratio, active in competitive segments with products that are sensitive to product substitution. Bunge does not publicly disclose its customer base. In its 2016 annual report, Bunge states that the principal purchasers of its (soy) oilseeds, grains and soy meal are animal feed manufacturers, livestock producers, wheat and corn millers and other oilseed processors. The principal purchasers of its unrefined vegetable oils are edible oil processing companies. As for its edible oil products, Bunge’s customers include baked goods companies, snack food producers, restaurant chains, foodservice distributors and other food manufacturers who use vegetable oils and shortenings as ingredients in their operations, as well as grocery chains, wholesalers, distributors and other retailers who sell to consumers under Bunge’s own brand names or under private labels. These customers include global and national food processors and manufacturers, many of which are leading brand owners in their product categories. Based upon the information presented in the 2016 annual report, it can be assumed that the largest animal feed and food manufacturers in the world are the main customers of Bunge. A 2014 investor presentation by Bunge discloses some of its food ingredient customers, including companies like Nestlé (Switzerland), Kellogg (United States) and Mondelēz International (United States). Bloomberg’s supply chain analysis also lists New Hope Liuhe (China), Ttet Union (Taiwan), METRO (Germany), Companhia Brasileira de Distribuição (Brazil), Axfood (Sweden), Kerry Group (Ireland) and Grupo Bimbo (Mexico) as customers of Bunge. Even though not all these companies are necessarily buying Bunge’s soybeans sourced from Piauí, reputational damage risk perception might affect the relationship between Bunge and the part of the customer base that has made zero-deforestation commitments. Most of the identified customers of Bunge mentioned in the paragraph above are also part of the Consumer Goods Forum, and next to that well-known large companies and likely customers of Bunge such as Unilever (Netherlands/United Kingdom), Danone (France), Procter & Gamble (United States) and Tyson Foods (United States) are members. Scenario 2: Bunge continues to source deforestation-linked soybeans from Piauí, putting at risk its relationships with the 23 members of the Consumer Goods Forum that support the Cerrado Manifesto (see below). If Bunge stops sourcing deforestation-related soybeans from Piauí, it will not risk any of its existing relationships with Consumer Goods Forum member customers. Therefore, the only two risks for Bunge in this scenario are potentially-stranded assets located in Piauí and a small potential decrease in net revenues caused by an inability to immediately source all necessary soybeans from somewhere else. However, we estimate that this will not significantly affect revenues, since any potential inability to source soybeans will only last for a short period. The partial halt of sourcing soybeans from deforested land in Piauí will have an impact on Bunge’s assets located in this region. If Bunge must temporarily close some of its existing facilities in Piauí, or change its infrastructure so that it does not source soybeans from certain parts of Piauí, it can be assumed that this will have a negative impact on the valuation of its non-current assets (fixed assets). According to the annual report for FY2016 (page F-71), the value of Bunge’s Brazilian non-current assets was USD 2.45 billion at the end of December 2016. These represent 39.5 percent of Bunge’s total non-current assets. According to the sustainability analysis presented above, Bunge has 100 facilities located in Brazil, seven of which are located in Piauí. Therefore, as a rough estimate, we contribute 7 percent of the value of the Brazilian non-current assets to Piauí. Figure 7 shows these three outcomes. The impact of a 30 percent reduction of the book value of the Piauí assets translates into a 0.5 percent decrease of the net asset value per share which is equal to 0.3 percent of the share price. If the value of the Piauí assets decreases by 50 percent, this will result in a 0.8 percent decrease in net asset value per share which is equal to 0.6 percent of the share price. Finally, in the case that 100 percent of the Piauí assets are impaired, this will lead to a 1.5 percent decrease in the net asset value per share, equal to 1.2 percent of the share price. This last scenario is the most likely scenario if Bunge completely stops sourcing deforestation-linked soy from Piauí. Figure 7: Bunge’s stranded asset analysis for Piauí Source: 2016 Annual Report Chain Reaction Research. The analysis above shows that even if all of the non-current assets in Piauí have to be impaired, the impact on Bunge’s net asset value and share price would still be minimal. This indicates that the potential loss of stranded assets in Piauí does not pose a severe risk to Bunge and its investors, and therefore offers opportunities for Bunge to stop sourcing from Piauí without experiencing significant impact from non- current asset impairments. The 23 companies that support the Cerrado Manifesto have committed to working with local and international stakeholders. Therefore, by not halting sourcing deforestation-linked soybeans from Piauí, Bunge might risk its existing relationships with these companies. It is likely that some of these companies are important customers for Bunge, since among the 23 companies (mentioned above) are some of the world’s largest food/retail companies. To estimate Bunge’s revenue at risk, we assume that the 23 companies together account for 10 percent of Bunge’s total net revenues (less than 0.5 percent each), which translates into USD 4.7 billion, taking the FY2017 estimate as the base revenue. The average gross margin over the last five years was 5 percent. Assuming that this gross margin stays on the same level, the loss of gross profit and the impact on EBITDA would be USD 0.2 billion. If these revenues do not ‘leak’ to new customers, the value of this would be USD 2 billion in a discounted cash flow calculation which is equal to 13.3 percent of Bunge’s current Enterprise Value (Figure 8) and 21.7 percent of its market capitalization (Figure 8). However, it is to be expected that Bunge will find other companies in the fragmented animal feed/food market to substitute some of the 23 companies and can thereby somewhat reduce the overall potential effects of this scenario. Still, compared to Scenario 1, this scenario poses much more financial risk to Bunge. This scenario also assumes that Bunge’s non-current assets in Piauí do not have to be impaired, because of the possibilities for Bunge to find substitutes for the 23 companies that support the Cerrado Manifesto. Overall, the results from the analysis above show that Scenario 1 (reputation risk reduction) is by far the most financially appealing scenario for Bunge. In Scenario 1, Bunge does not put any significant revenue at risk and the impact of its stranded assets in Piauí is likely to be minimal, equal to at most 1 percent of its share price. In Scenario 2, Bunge puts a larger part of its revenue at risk, and the financial impact is equal to 22 percent of the equity value. Figure 8 shows financial indicators of Bunge related to the division of financing. As can be seen, Bunge’s net debt amounted to USD 4.9 billion at the end of September 2017. This is an increase of USD 1.1 billion compared to December 2016, and this increase translates into a rise in the net debt/EBITDA ratio from 2.3X to 3.8X. Issued bonds are the largest component of the outstanding gross debt and bank lending the minority. However, at the end of September 2017, Bunge had USD 4.7 billion of unused and available borrowing capacity under its committed credit facilities with a number of lending institutions. Figure 8: Division of financing of Bunge; Equity versus Debt. Source: Bloomberg, Chain Reaction Research. 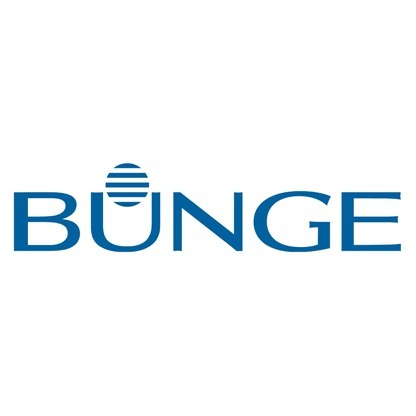 Bunge is listed on the New York Stock Exchange. Figure 9 shows the top 10 shareholders of Bunge as of the most recent filing dates. As can be seen, all of the top 10 shareholders are from the USA. These shareholders all score poorly in the Forest 500, a ranking of financial institutions and companies on their deforestation policies. Figure 9 also shows the shareholders of Bunge that score 3 out of 5 or higher in the Forest 500 ranking: Crédit Agricole (France), Goldman Sachs (NYSE:USA), JP Morgan Chase (USA) and Allianz (Germany). Because of reputational risk, some of these financial institutions might be inclined to consider engagement or divestment options. Figure 9: Top 10 shareholders of Bunge as Jun-Oct 2017 (most recent filing dates). Source: Thomson Reuters Eikon, Chain Reaction Research. The outstanding gross debt mainly consists of issued bonds. Figure 10 shows the top 10 bondholders as of the most recent filing dates. As can be seen, most of these bondholders are US-based asset managers that score below average on the Forest 500 ranking. These bondholders are not likely to be easily incentivized to consider engagement or divestments possibilities, except maybe JP Morgan Chase (USA). AXA (France), Allianz (Germany) and Crédit Agricole (France) are other important bondholders that have Forest 500 rankings of at least 3 out of 5. Some of these financial institutions might be inclined to consider engagement or divestment possibilities. Figure 10: Largest bondholders as of Jun-Sep 2017 (most recent filing dates). Source: Thomson Reuters Eikon, Chain Reaction Research. Bunge also has relationships with certain banks that have regularly provided loans, and have made available credit facilities which can be drawn upon if necessary. Banks are an important financing back-up for Bunge, since next to the outstanding loans Bunge in September 2017 also had USD 4.7 billion of unused and available borrowing capacity under its committed credit facilities with several lending institutions. Figure 11 shows the most important banks that provided loans and/or have made available credit facilities to Bunge since January 2014. As can be seen, seven of these financial institutions score 3 out of 5 or higher on the Forest 500 ranking. Some of these financial institutions could be inclined to engage with Bunge on their activities in Piauí or to consider divestment possibilities. This poses a severe risk to Bunge, since the company cannot afford itself to risk losing access to credit facilities which it might need to access capital in the future. Figure 11: Most important banks since January 2014. Source: Thomson Reuters Eikon, Chain Reaction Research, Forest 500. The analysis above shows that only a few of the Top 10 shareholders and bondholders (see Figure 9 and Figure 10) would be inclined to engage or divest. However, seven out of 10 of Bunge’s most important providers of loans and credit facilities are likely to consider engagement and divestment options, indicating that when it comes to loans, Bunge risks losing important (potential) financiers when it keeps sourcing from Piauí. This could lead to higher financing costs, which would impact the cost of capital. Figure 12 shows the peer group valuation. Bunge’s current P/E and P/B ratios are high, laying 13.7 percent and 10.7 percent above average respectively. Its EV/EBITDA multiple, on the other hand, is relatively low, scoring 16.5 percent below average. If we take a look at the two scenarios that estimate the impact of Bunge either stopping with sourcing deforestation-linked soybeans from Piauí or continuing its current activities, the impact on EBITDA would be, respectively, zero and USD 0.2 billion. The estimated decrease in EBITDA for Scenario 2 would lead to a higher EV/EBITDA multiple, which would lead to EV/EBITDA multiple that would increase to 14X. Of course, it has to be taken into account that Bunge is likely able to find other companies in the fragmented animal feed/food market to (partly) counter the revenue at risk, but this might only be possible over a longer period. Similarly, if we analyze the impact of the potential stranded assets of Bunge in Piauí (Scenario 1) on the P/B ratio, we can see that the impact of our estimates on the book value would be USD 34.0 million (30 percent impairment), USD 56.6 million (50 percent impairment) or USD 113.3 million (100 percent impairment), which would translate into a 0.5 percent, 0.8 percent or 1.5 percent decrease in the book value per share. This would lead to a very slight increase in P/B ratio, which does not really impact the current relative valuation picture. Figure 12: Peer group valuation. Source: Bloomberg, Chain Reaction Research. In conclusion, the analysis above shows that the scenario in which Bunge stops sourcing deforestation-linked soybeans from Piauí (Scenario 1) is most beneficial for Bunge, since in that case it does not put any revenue at risk and only incurs an insignificant impact of stranded asset impairment on the overall results. The scenario in which Bunge continues to source deforestation-linked soybeans from Piauí put a substantial part of the revenue at risk, which could severely impact the EV/EBITDA multiple and other financial parameters.